A common problem when SmartNodes are unable to register with 3CX happens to be caused by the auto-blacklist feature by 3CX. After a number of failed registration attempts to 3CX, a device will be blacklisted automatically, thus preventing registration and communication between the SmartNode and the 3CX PBX. To circumvent this issue, all the user has to do is allow/whitelist the IP address of the Patton device. To allow the Patton device, the user just has to navigate to the dashboard on 3CX and select the "IP Blacklist" option. If the Patton device was auto-blacklisted, you will see the Patton's assigned IP address in this list with the Action stated as "Deny." From here, clicking the blacklisted IP address of the Patton will give you the option to switch the action to "allow." This subsequently allows communication between the Patton device and 3CX again. 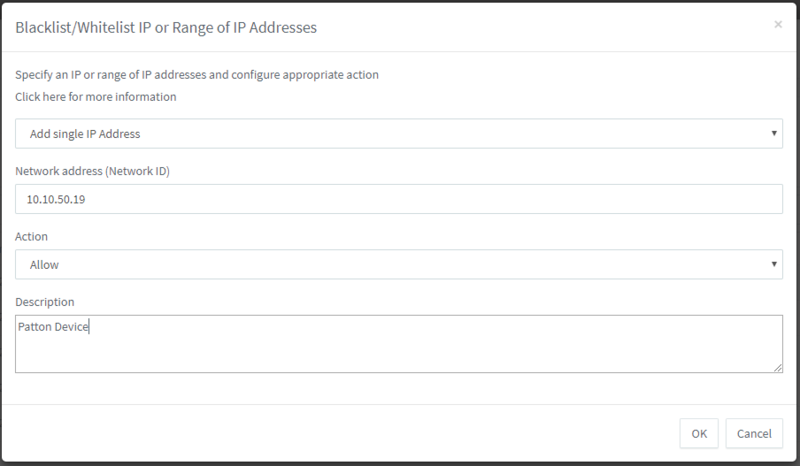 From this screenshot you can see the that you are allowing a single IP address, and the network address shown is a Patton device (as noted by the description). Once you hit OK, then the device will be able to freely communicate with 3CX, and will also be immune to future blacklisting.